The gpiozero package contains a database of information about the various revisions of Raspberry Pi. 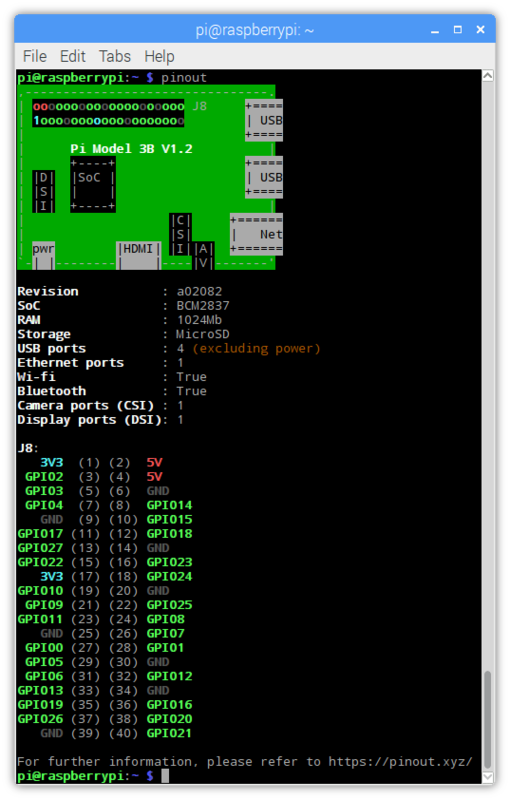 This is queried by the pinout command-line tool to output details of the GPIO pins available. A utility for querying Raspberry Pi GPIO pin-out information. Running pinout on its own will output a board diagram, and GPIO header diagram for the current Raspberry Pi. It is also possible to manually specify a revision of Pi, or (by Configuring Remote GPIO) to output information about a remote Pi. The library to use when communicating with the GPIO pins. Defaults to attempting to load RPi.GPIO, then RPIO, then pigpio, and finally uses a native Python implementation. Valid values include “rpigpio”, “rpio”, “pigpio”, “native”, and “mock”. The latter is most useful on non-Pi platforms as it emulates a Raspberry Pi model 3B (by default). The hostname of the Raspberry Pi the pigpio library should attempt to connect to (if the pigpio pin factory is being used). Defaults to localhost. The port number the pigpio library should attempt to connect to (if the pigpio pin factory is being used). Defaults to 8888.